You all know that I love me some Entenmann's® Little Bites® Muffins, but I get especially excited when they release a new Seasonal Favorites® flavor into their scrumptious muffin lineup. 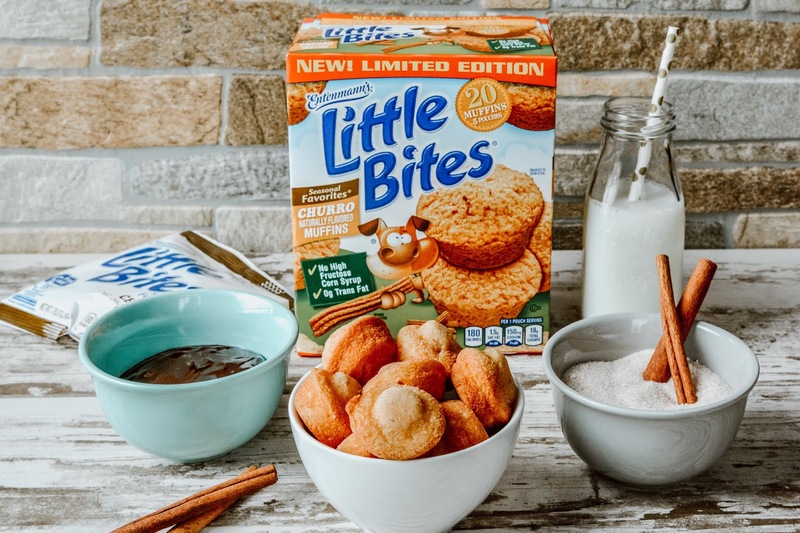 Fresh into this season, Little Bites® is introducing us to their newest flavor: Churro Muffins, and they are definitely muy delicioso! Churro Muffins are the newest addition to the Little Bites® line of products. Filled with the irresistible flavor of real cinnamon and sugar with a little sweet crunch that you expect from a churro, these limited edition muffins have quickly become a fast favorite in my household. 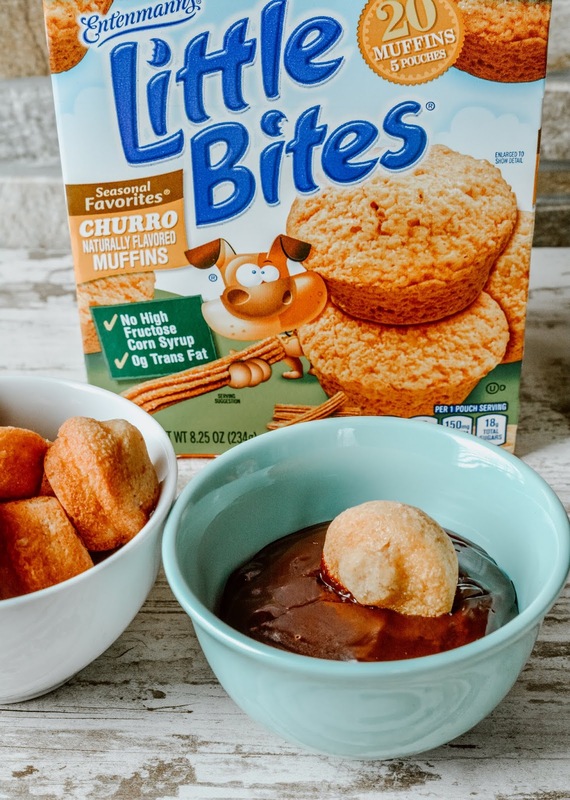 Little Bites® Churro Muffins come in convenient portable pouches, 5 per box, and at only 180 calories per pouch is a snack I don't feel guilty indulging in. I love being able to get my churro fix without consuming the fried dough of a churro. And, since Little Bites® muffins contain no high-fructose corn syrup or trans-fat, I don't mind letting my family indulge in them as well. 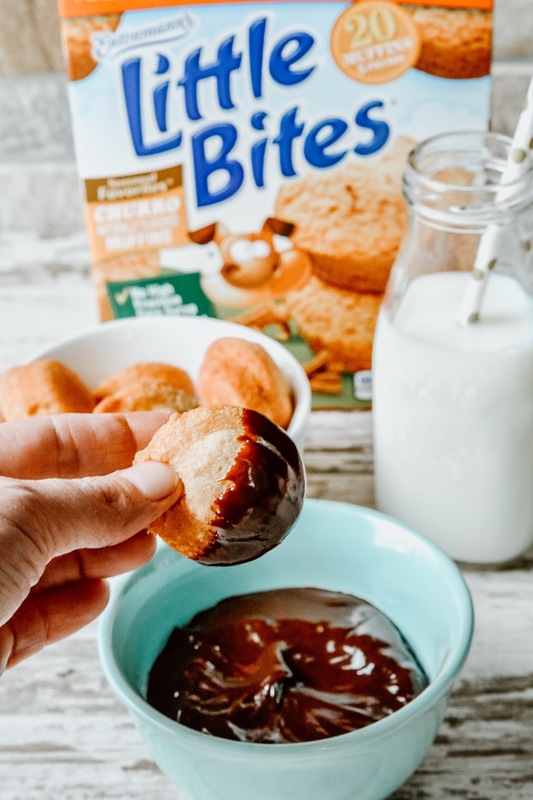 Of course, we love Little Bites® right out of the pouch, but what's a churro without some melted chocolate? If you want to be a little extra with your Little Bites® Churro Muffins, melt a bit of chocolate to serve alongside them. I'll even use hot fudge sundae topping to dip mine into. Yum! Entenmann's® Little Bites® Churro Muffins are now available in most major retailers nationwide. I was able to purchase mine at Meijer, but you can also find them at Walmart, Kroger, and Target stores. Remember, these are a limited-edition Seasonal Favorite®, so be sure to grab yours asap! One lucky Theresa's Mixed Nuts reader is going to win a $25 Visa Gift Card + (3) coupons for $5 off Little Bites® Muffins. Giveaway is open to residents of the U.S., 13+. No PO Boxes will be accepted. Winner will have 24 hours to respond to winning email before a new winner is selected. Please enter on the giveaway widget below. You're killing me, Theresa, with these delicious looking "Little Bites," not to mention the chocolate dip. I have 10 pounds to go on my diet ~ but at 30 calories apiece and no chocolate I might be tempted. Your bean soup was delicious for dinner last night, after two days in the fridge. Your product photos are always excellent! Have a good one! Yes, that bean soup is even better as leftovers when the flavors have time to marry together. Glad you enjoyed! I think I vaguely recall what a churro is, but I'm not sure! It's fried dough coated in sugar and cinnamon. Really tasty, but very fattening. Usually gains more popularity around Cinco de Mayo since it's a Mexican dessert. As a lover of chocolate, I would like to try the Little Bites Fudge Brownies! My kids would probably like them as well. I'd love to try the Little Bites Banana Muffins! I would love to have the Little Bites® Party Cake & Brownie Variety Pack 24 count for the office. I love Entenmann's coffee cake and donuts. I haven't had them in a while but they are so good. These sound really good too. But for something new I would like to try the brownies, those sound good and I do love anything chocolate. The brownies will probably always be my all time favorite Little Bites flavor, but it is nice to branch out and try the new ones too from time to time. I'd love to try the Blueberry Little Bites. Also, the brownie ones are one of my families favorites. Sounds like a winner indeed. Can't go wrong with a pup as a mascot either. I would enjoy the Little Bites Fudge Brownies with my afternoon coffee. My son loves the Little Bites® Party Cakes, I just bought that for him. I would also like to try the Little Bites® Snickerdoodle Muffins. They seem tasty also! Since I like Banana Bread, I know I'd love Little Bites Banana Muffins. Sounds tasty! I learned that the big packs can be bought with a variety. Hurrah, finally, woohoo! I'd go for the little bites strawberry yogurt muffins. I would like to try Little Bites Chocolate Chip Muffins. This Churro variety is the only one I have never tried. I seem to always miss the seasonal flavors they come out with. The crumb cake is my favorite, especially if I warm it in the microwave for a few seconds. I would like to try the Little Bites Snickerdoodle Muffins. I've been obsessed with banana lately (frozen bananas on my protein shakes are the best! ), so I'd definitely go with the banana muffins little bites! 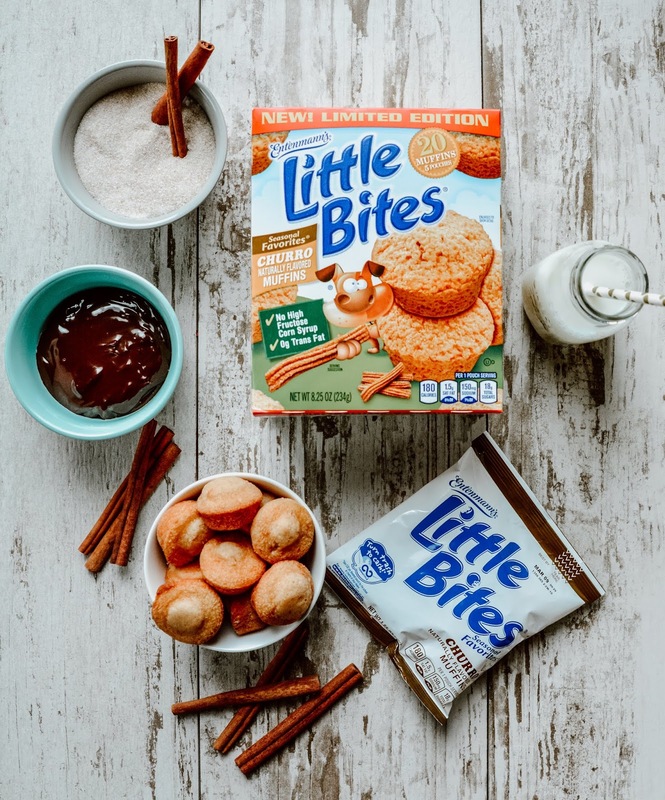 I would like to try Entenmann's Little Bites Snickerdoodle Muffins. I have tried the Blueberry flavor and like those. 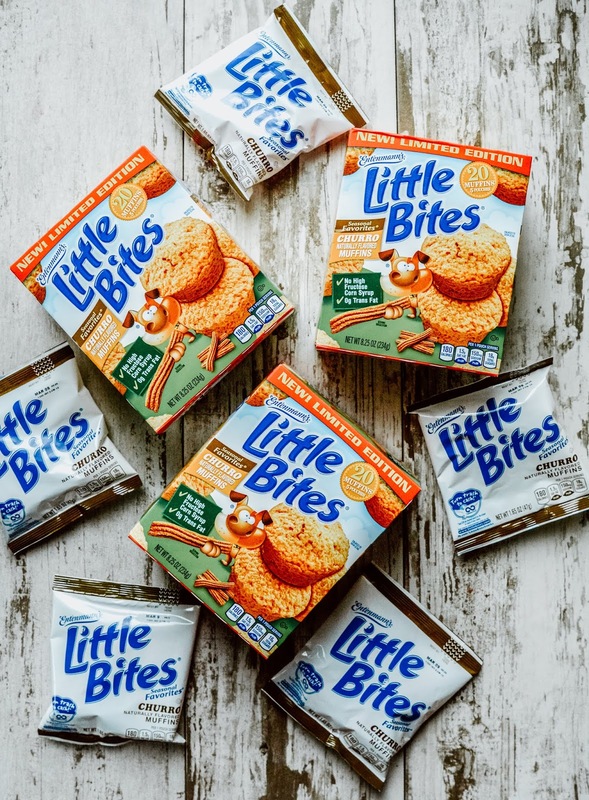 I still haven't tried the crumb cake flavor of Little Bites. Those just look so good. I want to try out the Little Bites crumb cakes! I want to try the Sugar Cookie muffins! My twins would love them! I love the blueberry little bites! I would love to try the chocolate or bday party flavors with my kids! I would like to try the little bites crumb cakes. I've never tried their strawberry yogurt muffins so I would like to try those. They sound delicious. I wan to try the Sugar Cookie Little Bites. My son had them and said they were really good. I want the sugar cookies so badly! They look amazing. Thank you so much for the offer. I want to try the banana muffins! I would love to try the vanilla ones. I would like to try the sugar cookie muffins from little bites. I have tried them all. My fave is blueberry. I would like to try the sugar cookie one. I would like to try the banana muffins!!! I am a faithful lover of the Little bites blueberry muffins! My family counts on them being in the house! I'd like to go for those chocolate chip muffins. They look like just the right size to go with a cup of coffee in the morning. That would be so much easier that baking from scratch. I would like to try out the Little Bites Banana Muffins. I would love to try the Little Bites Snickerdoodle muffins. They look so good. I would like to try the Strawberry Yogurt Muffins. They sound so moist and delicious. I missed out on the Snickerdoodle muffins that they had over the holiday season. I hope that they return with those! I would love to try the Little Bites Party Cakes. Oooo I haven't tried these.